Even with all the interest in the status and future of first year coach Lane Kiffin, if any question other than “Who will start at quarterback?” was asked more often this past year around FAU, we don’t know what it could be. Kiffin’s first spring didn’t yield a surefire starting quarterback, leaving the Owls to open the first fall camp under their new coach searching for a leader. Transfer De’Andre Johnson appeared to have the lead, trailed by incumbent Jason Driskel and redshirt freshman Daniel Parr, who missed all of the spring while recovering from a broken foot. By the end of fall camp Parr went from third team to starter, and Driskel dropped all the way to third string. Two weeks into September Johnson underwent season-ending surgery to remove blood clots from his arm, removing him from the equation. FAU defeated Bethune-Cookman 45-0 in the third week of the season, giving Kiffin his first victory as Owls’ coach, but the victory didn’t sit well with the coaching staff. 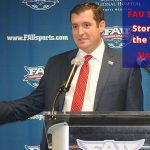 As a result Kiffin elevated Driskel to starting quarterback, and while FAU fell to Buffalo in Driskel’s first start, he led the Owls to victories in the next 10 games, including the Conference USA championship game and the Boca Raton Bowl title. Driskel threw for 2,247 yards and 15 touchdowns, adding 427 yards and eight more scores on the ground. He brought stability to the Owls’ offense, which in turn allowed it to become more explosive. The stability didn’t last long. Driskel announced prior to the start of spring practice that he would not return for his final year of eligibility, re-opening the quarterback competition for 2018. Cleared to return to practice, Johnson battled Oklahoma transfer Chris Robison for the starting spot (Parr transferred to Duquesne for the spring semester). Johnson struggled to regain arm strength, but as spring progressed the zip began to return. Robison showed moxie, but drew Kiffin’s ire at times with ill-advised throws. As a result, the quarterback battle will continue into fall camp. Three Way Battle at QB? Driskel’s mastery of the Lane Kiffin/Kendal Briles ultra uptempo offense showed how potent the Owls can be with the proper signal caller behind center. Driskel wasn’t the most physically gifted quarterback, but he led the Owls to and average of 46 points in Conference USA play, 10 more than the next highest scoring team. His ability to get the Owls out of bad plays and into good ones, making the most out of small gains while avoiding turnovers, led to both quick strikes and long drives. Despite holding Conference USA’s highest passer efficiency rating, Driskel may well have found himself back in a battle this spring had he elected to return. When healthy, Johnson displayed arm strength and elusiveness both in the pocket and down field that gives defenses fits. Robison signed with Oklahoma as one of the top quarterback prospects in the nation but was kicked off the team following an arrest for alleged public intoxication, leading to his transfer to FAU. By removing himself from the quarterback conversation, Driskel ensured that FAU will enter the 2018 season opener at Oklahoma with a quarterback behind center making his first start for the Owls. It’s even possible that the player who takes the first snap against the Sooners isn’t yet on the roster. Kiffin has stated he will bring in a qualified graduate transfer at the position if the right one becomes available. 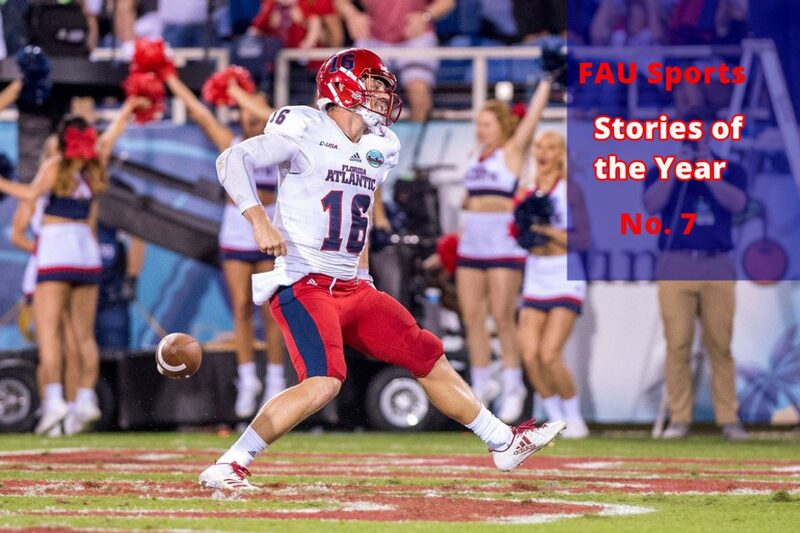 If either Johnson, a redshirt junior, or Robison, a redshirt freshman, can grab the reigns of the Kiffin rocket and perform like Driskel, it could mean that the FAU QB battle could take a hiatus for a year or two. 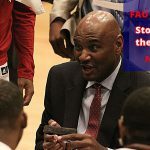 If not, the battle will continue to be one of the most intriguing FAU football stories.